Thanks, with due respect, I went through each post on the 4 pages. Still can't see any link to APH that shows an official rejection or even a parliament discussion on the F-35B. Granted, lots of media coverage including a link from baddams & gang but really, nothing that provides anything other than media hearsay that the ADF has rejected the F-35B. Just to give some context to my scepticism, about 10 years back I raised the possibility that the Japanese could buy the F-35B. Lots of similar responses about those suggestions being "fantasy"...Nothing in Japan remotely suggests this until last year. Another good reply from the 'weasel1962' - meanwhile an example of searching the downloadable PDF (perhaps with some difficulty with Internet Explorer 11 users BUT Edge & Firefox Win10 users should be OK; something happened to IE11). 02 May 2014 PM Abbott: "We are certainly retaining the option to purchase an additional squadron — a further 18 Joint Strike Fighters and we haven't decided precisely what type it might be — that will be something that will be looked at in the context of the coming Defence white paper." 23 May 2014 “Prime Minister Tony Abbott has instructed the authors of the new Defence White Paper currently in preparation to consider the acquisition of the STOVL F-35B variant of the F-35 Joint Strike Fighter to operate from the Navy’s forthcoming LHD amphibious ships. “It is understood Mr Abbott has instructed planners working on his defence white paper to examine the possibility of putting a squadron of 12 of the short takeoff and vertical landing version of the JSFs — the F-35B — on to the ships,” a report in The Australian newspaper on Friday says...."
"...Facing a Senate hearing on Monday, Defence chiefs said little work had so far been done on the possibility of buying a short take-off & vertical landing variant of the Joint Strike Fighter - an idea that has seized the interest of the Prime Minister. Under questioning by Labor defence spokesman Stephen Conroy, defence chiefs confirmed for the first time that Mr Abbott had asked them to look at the merit of buying the F-35B jump jets under the forthcoming Defence White Paper & accompanying Force Structure Review. Under the proposal, they would be flown from the navy's 2 Landing Helicopter Dock amphibious assault ships, which are due to come into service over the next 12 to 18 months. Chief of Air Force Air Marshal Geoff Brown said the force had not asked for the F-35B but added the idea should be examined along with all other credible options. "Like all things when you have a new White Paper, you should always examine all sorts of options ... It wasn't something the air force has particularly pushed," he said...."
From page 46 to page 52 there is an extensive quote from Fed Parliament Inquiry. I'll let you read it ala 'optimist' method. "...CAF [AM Geoff Brown RAAF] also revealed that Air Force is currently studying the potential operations of a short take off vertical landing (STOVL) F-35B from the decks of Navy's new Landing Helicopter Dock ships. "...The F-35B proposal is being pushed by Abbott’s office..."
"...Neither the RAN, Australian Army nor, least of all, Royal Australian Air Force (RAAF) is publicly supporting the idea...."
There are other ABBOTT mentions as mentioned - I hope the more relevant ABBOTT quotes have been found in the PDF. Minister David Johnston saying it was considered from day one ..also means it was a stupid idea we threw out years ago. optimist wrote: yes, spazsinbad. all from the 2014 period. There was a lot said during that time. Then crickets and no addition to the white paper. Went to the link and there is no reference to F-35B. Now realised one has to click on the left link to access the discussions so my apologies. However what I read doesn't help your case. It points more to "its too early." Exactly what Spaz mentioned and he has the salient quotes. Senator CONROY: Regarding the new LHDs, a couple of weeks ago The Australian reported that the Prime Minister has, 'Instructed planners working on his Defence white paper to examine the possibility of putting a squadron of 12 of the short take-off and vertical landing version of the JSFs—the F-35B—on to the ships.' Are you familiar with that article, Vice Admiral Griggs? Vice Adm. Griggs : I am. Senator CONROY: Has the Navy been asked to provide any input to this possibility? Vice Adm. Griggs : What is happening is that the whole issue of short or vertical take-off aircraft is being considered as part of the force structure review and the white paper process. We will participate in that, as will Air Force. I welcome that. Vice Adm. Griggs : No, he probably does not. Air Marshal Brown : Depends on your answer. Vice Adm. Griggs : There has been some work already done, and it was done during the 2008-09 force structure review white paper process, to understand what the implications would be. It largely revolves around ablative coating on the flight deck because of the heat generated from the F35-B. It relates to fuel storage and fuel lines. It relates to amendments or modifications we would have to make to magazines on the ships to take the weapons that support the F35-B, and there are other aspects like some of the classified compartments that we would need to make sure existed to support the mission system for the F35-B. I think I have covered most of the issues. Senator CONROY: You mentioned storage, planes equipment, fuel, munitions and support crew. Can you just outline what those changes would need to be? Where are we up to with the LHDs? Where are they being put together? Vice Adm. Griggs : In Williamstown. Senator CONROY: I thought so. I saw it on the weekend. I live in Williamstown, as you probably remember. What sort of changes in storage for the actual planes, or the equipment, fuel, munitions, and support crew would you need to make? Because for being put together they seem to be a fairly long way down the track right now. Vice Adm. Griggs : Canberra will deliver some time in the third quarter of this year, probably around September. Senator CONROY: It looked in pretty good shape. Vice Adm. Griggs : So, it is not that far away. We have to, obviously, do some more work on this, because I would say this has been a fairly superficial examination up until now because there has not been a serious consideration of this capability going into the ship. Senator CONROY: Air Marshal Brown, did you ask for this capability? Did the Air Force request this? Air Marshal Brown : Like all things, when you have a new white paper you should always examine all sorts of options. It was not something that Air Force has particularly pushed. I would just like to add to Vice Admiral Griggs's modifications required to the ship. One of the big issues with having fixed wing aeroplanes come back onto a ship is you have actually got to get them back in poor weather. So, there would be new radars required on the ship as well as instrument landing systems. So, there will be some extensive modifications around that. Gen. Hurley : I think the start point of this, as Vice Admiral Griggs has pointed out, is there is the need—if we look at the phases we go through, there are needs and then requirements. We are starting at what are the requirements, that is, how do we adapt the ship and what does a ship that launches vertical take-off aircraft look like. There are two parts to the Prime Minister's request. One is to drive it back to see how would this fit into the force structure of the future, how would it meet the needs of the future and so forth, and then we would do the prioritisation, stack it up against other needs and so forth into the future—they come out of the white paper. Once you have gone through all that, if you were to say, 'Okay we need to have this type of capability and we are going to now go through what that would cost and then what the opportunity costs are', then we will go down and say, 'Okay, how would you modify a ship to put this capability in?' That would be part of that costing process. It is a number of steps to actually get to that detailed questioning you are asking at the moment. Senator CONROY: I appreciate that, General Hurley. I am simply going on a newspaper article that bobbed up and seeking to establish for the committee an understanding of what would be involved in making that sort of change right now. We are a fair way down getting the strike fighters, we are a fair way down of—last time I looked on the weekend, it was getting more impressively large and to suddenly throw a curveball in like this at relatively the last minute—I appreciate we do have things in the pipeline—it just seemed like an odd thing to do. Senator CONROY: Mr Richardson, join us. Mr Richardson : It is a reasonable question about that option, and it is being examined in the context of the force structure review. Senator CONROY: Are you able to take this on notice? Air Marshal Brown indicated radars would be an extensive change. Vice Admiral Griggs described some. Are there any other changes to the structure of the ship? You mentioned the deck; obviously that makes sense. Air Marshal Brown : I will just defer to the secretary, I think there is a lot. Senator CONROY: Does the deck need to be reinforced or is it just a paint job? Senator CONROY: A special paint, but an application. Air Marshal Brown : There is a lot of work to be done conceptually before we get to that stage, so it would be a little speculative to just give you a list of modifications to the ship at this stage. Senator CONROY: Would there be different personnel, training, aircraft maintenance or pilots needed in the circumstance? I see you are nodding there. Is there anything that you can tell us on that? Air Marshal Brown : I think it is early days as to how much. There certainly would be differences in training as to how much that would require. There would be issues that we would have to go through. There would be a different logistics system as well for that aeroplane so, again, a fair bit of work to go through. Senator CONROY: It has been a long time since the Navy had a ship capable of launching aircraft. What sort of organisational changes would you need to make to carry that capability out today? Would they be operated by Navy pilots or Air Force pilots? Who would own them? Gen. Hurley : I would own them. Senator CONROY: That goes without saying that the CDF would own them. I am just interested if there was going to be a dogfight there, no pun intended. Gen. Hurley : No, I am trying to stop one. We need to go back to the processes that we have in place with the white paper force structure review and look at the place of a capability in this. Those types of questions that you are asking are long-term questions. For us to speculate whether we have a new fleet air arm that is bigger which now has fixed wing capabilities to strike off a carrier looking aeroplane, frankly it is just too early. We are not anywhere near that mode. Although they are interesting and intriguing questions and will keep our younger people very busy around the coffee table at the moment, they are pure speculation. Senator CONROY: Our Prime Minister is tricky like that. You have got to watch him. Gen. Hurley : It is pure speculation. Senator CONROY: I am quoting the Prime Minister's leak to The Australian. I have not double-checked but I am willing to bet it said exclusively. Gen. Hurley : I think we are in the situation where new governments come in. There has been a white paper evolving for a while. We have had a platform that is about to come into the service which is essentially based around delivering an amphibious capability built around ship-to-shore, which is helicopter borne and the small boats from the well of the ship. The Prime Minister has a view about a capability that he thinks might be relevant to the ADF. He has asked us to look at that. We have a process in place at the moment that will allow us to have a look at that and, depending where we come out on that process, we would then go into all of those technical decisions about the nature of ship and force structure implications for the ADF. I do not want to touch it yet until I know whether I am going to have one. Senator CONROY: Minister, you just cannot take your eye off that Prime Minister, can you? He is just full of good ideas. Senator Johnston: I think you might concede the Prime Minister is interested in exploring options. He wants a versatile, capable ADF and there is no harm in exploring with the experts what the options are. I think that is perfectly normal and natural and he should certainly not be criticised for it. Senator CONROY: I was just saying that you have got to keep your eye on him every minute. He keeps jumping in there on you. Can I just clarify—and I appreciate the point you are making, General Hurley, that no-one has actually made a decision about it, but just for the purpose of the committee understanding what it would mean if you were to go down that path, without going into too much detail—the discussion relates to the fourth operational squadron of JSFs purchased in addition to the existing 72 which are already on order. When is the last of those 72 expected to be delivered to Australia? Air Marshal Brown : We expect the last of the JSFs in that tranche in 2022. Senator CONROY: When is the second LHD expected to enter service? Vice Adm. Griggs : 2016. Senator CONROY: So if we were to choose to proceed with the purchase of any B-variant JSFs as a fourth operational squadron they would likely come into service well after both of the current LHDs enter service. Is that correct? Gen. Hurley : That would be correct. Senator CONROY: That would seem to be the case? Senator Johnston: You would think so. Senator CONROY: I was at Forgacs in Newcastle recently and I had the 1-3-8 rule explained to me. It was said that if something cost $1 to build on the workshop floor at a facility like Forgacs that it would cost $3 to build once these blocks have been combined and it would cost $8 to do it once you are working inside the whole of a commissioned Navy vessel. Does that sound about right? Vice Adm. Griggs : There is no doubt it costs more to modify them to design and to build, yes. Senator IAN MACDONALD: I thought it was 1-2-5. Senator CONROY: Maybe they are already gilding the lily on me. They are buttering me up in advance. With that in mind, does it seem like a sensible financial decision to make significant alterations to the LHDs once they are well into their operational lives within the Navy fleet? Mr Richardson : We are not at that point. Senator CONROY: But if you were to make that decision? They are in the water in 2016. Mr Richardson : We are not at that point. The first step is part of the force structure review. Anything beyond that is speculative at this point. Senator CONROY: This is just like two plus two equals four. If the ships are already in the water it costs more to adapt them to a new Air Force purchase if we make a new Air Force purchase. Mr Richardson : Of course it does. Senator CONROY: Depending on whether it is an Air Force or a Navy purchase in that sense? Senator CONROY: That is just maths? Mr Richardson : That is right. Senator CONROY: It is not about the high level. That is what you would be thinking about when you would be having a conversation in the Defence white paper? Mr Richardson : Yes, that is right. Senator CONROY: Would it make more sense to buy or build a purpose built light aircraft carrier to act as a platform for any future JSF B-variants? This is not just a backdoor way to sneak an aircraft carrier into the game, is it? Senator IAN MACDONALD: That is certainly hypothetical. Mr Richardson : It is. Senator CONROY: I am saying that it is going to cost a lot more to make the changes. You would be the first vice admiral to have an aircraft carrier on your watch for a while. Mr Richardson : You are getting way ahead of where we are at. Mr King : The ships are in service for 35 years. In the course of their life, requirements of them change and all the matters that have been raised like costs and amount of change, the national interest is considered in doing that. It is true that there is a different cost after you enter service, but if it is in the national interest and that is a cheaper way to get a capability—and I am referring to the general ship modifications—then that is what a country does, but it is a long way off such a decision. Senator CONROY: How much do you think it would cost to modify the LHDs to accommodate the variant? Mr Richardson : We are not prepared to speculate on anything like that in advance of having done the work. Senator CONROY: The Prime Minister's office has put that into the public domain. Mr Richardson : We are not prepared to speculate. The Prime Minister has not speculated on that. Senator CONROY: I said that the Prime Minister's office has put that into the public domain. Mr Richardson : I do not believe the Prime Minister's office speculated on costs. You are asking us to speculate on costs before we have done any work, and it would be inappropriate for us to do so. Senator CONROY: I will ask you a technical question rather than a cost question. Would an LHD modified to operate as a launching platform for the JSF also be able to operate as an amphibious vessel as well? Vice Adm. Griggs : Yes, but there are trade-offs that you would have to make. Senator CONROY: Would it still be possible to load the same number of helicopters and landing craft that are planned for the existing LHDs? Gen. Hurley : It is just impossible to answer that question because we do not know whether (a) we will have the platform, (b) what modifications are actually required and (c) what would be the change to capabilities to the ship. Senator CONROY: We do know a few things, though. Gen. Hurley : To be very honest, we cannot answer questions of that nature. That is just asking us to do the impossible. 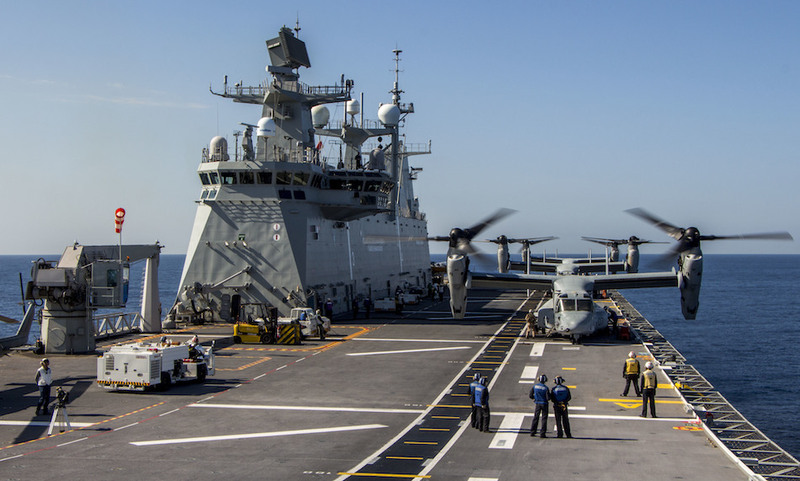 Senator IAN MACDONALD: The better question might be whether there are any other LHD type vessels around the world that have been built by Spain or anyone else that have a fixed wing aircraft take-off capability? Vice Adm. Griggs : The LHD that we have? Senator IAN MACDONALD: Yes. Is any other navy using it as an aircraft carrier? Vice Adm. Griggs : The Spanish do. Senator IAN MACDONALD: Do they? Vice Adm. Griggs : They use it as part of the mix of their aircraft that they have. Senator IAN MACDONALD: What sort of aircraft do they run off? Vice Adm. Griggs : AV-8B Harriers. Senator IAN MACDONALD: The English jump jet? Vice Adm. Griggs : The jump jet. Senator IAN MACDONALD: Do they jump them off or do they fly them off? Vice Adm. Griggs : They ramp them off the ramp. Gen. Hurley : I do not know. No-one at the table knows and no-one at the table should be asked to speculate on it. I do not know. Senator IAN MACDONALD: That is purely hypothetical and not under the rules of estimates. Senator CONROY: You are not actually chairing it, Senator MacDonald. CHAIR: Can we have some order? Gen. Hurley : I do not even know. It depends what sort of mix of helicopters. Do you want CH-47s and Tigers and MRH-90s? What does the mix look like? What are you going to substitute? What are you going to carry for a particular mission? Gen. Hurley : We know what mixes are possible but we do not know what changes to the ship would be required; therefore, how would we know which helicopters we cannot carry and what impact that would have on the operation? Senator CONROY: We can play a sillier game and say: could you squeeze some joint strike fighters in with all of the existing material that you have planned to be on them at the moment? Gen. Hurley : I do not know because I do not know what is required to put a STOVL onto the LHD. Gen. Hurley : Vice Admiral Griggs will not answer the question. I will answer the question, Senator. You are asking us to speculate on something we have no idea about. CHAIR: Senator Conroy, the witnesses have made it very clear several times that they are not prepared to speculate, and I think you should respect that. Gen. Hurley : Frankly, you are asking me who is going to be in the grand final of the VFL this year. Senator CONROY: That is easy. It will be Collingwood and it does not matter who else. It is very simple to answer that one. Gen. Hurley : I do not follow the sport. Senator IAN MACDONALD: I have a question, Chair. CHAIR: Senator Conroy, we need to move on so let us stick to substantial questions. Senator CONROY: I have many substantial questions and those ones were also substantial, based on information that has been leaked by the Prime Minister's office. CHAIR: Senator Macdonald has questions. Senator CONROY: I would like to ask some questions about the current use of the LHDs. Within the Amphibious Ready Group can you explain to me the activities such as ship to objective manoeuvres and distributed manoeuvres? Can you explain what is involved in those? Vice Adm. Griggs : You are using US doctrinal terms. Vice Adm. Griggs : I am sure the Chief of Army will talk about the land warfare aspects of this. Lt Gen. Morrison : I would characterise our knowledge of amphibious operations at the moment as suitable for what the ADF is currently asked to do primarily in relation to humanitarian assistance or disaster relief and operations up to perhaps service protected evacuation in relatively benign circumstances. We have managed to get to that point with Army and Navy working with the platforms that the Navy has had to date, the LPAs and HMAS Tobruk. The formation of an amphibious capability within Army is a process that is now underway, but we are only in the early days of it. I have designated one of our seven battalions as the force that will build our knowledge in that regard. At the moment, however, there are only two naval platforms that they are capable of working with; that is, HMAS Tobruk and HMAS Choules. It is not until we see the landing helicopter docks, the LHDs, actually in service that I think we will really start to build more rapidly an amphibious capability within the ADF. So at the moment, while we understand a number of points around doctrine and indeed current world's best practice because we have allies such as the United States and particularly the US Marine Corp sharing detailed information with us, I think we are not at a point where we could put a hand on our heart and say that we are well down the path now of a true amphibious capability within the ADF beyond that that we have been operating over the last two decades. Senator CONROY: Admiral Griggs mentioned that I was using American terms. What are our terms for that? Lt Gen. Morrison : Terminology is all well and good. Senator CONROY: It is just so that I can use the right language in the future. Lt Gen. Morrison : If you are interested we could provide a briefing for you. Senator CONROY: What would be the alternative to ship to objective manoeuvres and distributed manoeuvres which Admiral Griggs indicated were American terms? Lt Gen. Morrison : The American amphibious capability is well beyond whatever we are aiming at now or into the future. The US Marine Corp, the US Navy and the US Air Force, supported by other US military assets, are capable of conducting amphibious operations at a considerable size and capacity that the ADF will never have. Their terminology refers very specifically to what is intrinsic to the US military. I am loathe to start getting into descriptions of doctrine or terminology at this point with you because I think it would actually be confusing. It may point to a capability currently resident in the US forces that we are not going to have, so I do not think it is helpful. As I said, we could provide you with a briefing on this and take you through it to show you what we mean by various terms as they apply to amphibious operations with the necessary explanations and diagrams if that would be useful at any time that you may wish, provided the minister is happy. Senator CONROY: You mentioned doctrine before. I was going to ask who is responsible within Defence for developing our doctrine around this area. Lt Gen. Morrison : It is a shared capability between the Chief of Navy and myself. We have groups within both services that work together to develop joint doctrine, joint tactics and procedures. They are also supporting a great deal of the work that will actually have to be done as we start to operate at a level of amphibious capability that we have not been at before, and both Admiral Griggs and I have responsibility for that to the CDF. Senator CONROY: Taking on board your very valid point that we will not be reaching the capability of the US—and no-one suggests that we are going to and we have no intention to try to—when we compare what we are planning to do with our LHDs here in Australia—and this may be too early for you to be able to give us a fulsome answer—are we proposing that the second RAR will be seeking to achieve a specialisation in amphibious operations perhaps comparable to the Royal Marines or the US Marines? I am just looking for a general but if you are not that far down the track, then just say so. Lt Gen. Morrison : I think that is a fair characterisation of the path that we are on at the moment. Certainly there was a recognition within Army that we needed to commit a major unit to developing a complete understanding of what an ADF or an Australian amphibious capability actually will require in the future and 2 RAR has been designated as that unit. At the moment, as I said in answer to an earlier question, they have been able to work with HMAS Tobruk and HMAS Choules, but as yet they have not been able to work with HMAS Canberra, the first of the LHDs. They have had personnel attend courses here in Australia and also courses conducted by the US Marine Corp to deepen their level of expertise, but until the LHD is in service and indeed, until both LHDs are in service, I really think that at the moment what level of capability we will be able to reach is probably speculative. Senator CONROY: Do we have the infrastructure? It may be because it has not hit the water yet. It has hit the water but has not been completed. Do we have the infrastructure that surrounds these LHDs which would allow that level of specialisation? Are you confident where its specs are that you will be able to move in this direction? Lt Gen. Morrison : Yes, without doubt. Senator CONROY: When would you hope that the Amphibious Ready Group would be available for operations? Lt Gen. Morrison : Again, I think that will be dependent on a variety of factors; firstly, bringing the ships into service and then there will be other elements of both the Army and the Navy that will need to be worked up to a level of capability. I would not like to give you a definitive time on that because there are so many variables that come into play, but it is certainly something that both Navy and Army, indeed the ADF, are working towards and I am confident that we will reach it in an acceptable time frame. Vice Adm. Griggs : I can say that it will take around 12 months from the date the ship is delivered until we reach the initial operating capability. That is not the full operating capability. The initial operating capability will be about 12 months after delivery. We are anticipating delivery in late quarter 3 of this year, so late quarter 3 of next year would be the initial operating capability. I think it is really important that people understand what is involved in getting to that point. First of all the ship's crew have to learn how to operate the ship. We then need to do the work with the organic landing craft, integrate them into the ship and do the trials that we need to do. Then we need to bring the aviation piece into play and relearn multi-spot deck operations. Then we need to bring 2 RAR into play and put it all together for the initial operating capability, so it is actually quite a complex process. Senator IAN MACDONALD: It is on the water now, is it not? Vice Adm. Griggs : Yes, but it has not been delivered to the Commonwealth. Senator CONROY: They are still putting bits on each. I watch it grow each week. Vice Adm. Griggs : The point I am trying to make is that as soon as it is commissioned, which will be shortly after it is delivered, there will be expectations that the ship will be able to go and do all of these things. It will not. It will take 12 months post-delivery before it is available to meet its initial operating capability. Senator CONROY: General Morrison indicated that you really would not be able to get to the stage of that amphibious ready until we had both. Were you saying that you needed both? Vice Adm. Griggs : You would need both ships for the Amphibious Ready Group, which is different to the Amphibious Ready Element. Senator CONROY: Am I allowed to split a hair and ask what is the difference between the element and the group? Vice Adm. Griggs : One is a company size. Senator CONROY: You need both for all of that to be ready? Lt Gen. Morrison : plus its logistic elements or logistic support, helicopter support and whatever other assets would be made available to it for whatever the mission may be. The Amphibious Ready Element is a smaller part of the ARG. From a 2 RAR perspective it is based on one of the rifle companies that comprise the overall battalion. Of three rifle companies, this would be one of them and it would have smaller logistics elements in it with smaller helicopter assets and smaller enabling support. It is the ARE, of course, that we are aiming at first, as you would expect. As Chief of Navy has said, it is a very complex task getting this capability up and running. Senator CONROY: How important is this capability to our strategic interests? Lt Gen. Morrison : It has been a major feature of every white paper that I can recall certainly in the last 15 years. Australia is an island continent. It has a role in our region and our world and it affects military endeavours through a variety of means, but one of them is transit by sea in an amphibious way. Senator CONROY: It sounds like not just over 15 years that you have indicated we have been seeking this capability. It sounds like there is an awful lot of normal, sensible processes being put in place to bring us up to speed. Lt Gen. Morrison : Yes. Senator CONROY: Are you looking forward to having a joint strike fighter plonked in the middle of it? Lt Gen. Morrison : I think that all of the answers that you have been given from this side of the estimates table about joint strike fighters do not need any additions from me. Senator CONROY: It sounds like it might get in the way of your group. It is not like you have asked for it. Air Marshal indicated they did not ask for it; Admiral Griggs has indicated that he has not asked for it and from the sound of it you have not asked for it. 'Abbott aims for aircraft carriers' is the headline. I am just trying to get an understanding of what is involved in that. Thank you for that. I am happy to pass over to someone else, Chair, if there is anyone else. I have more questions in this area but if someone else wanted to jump in; Senator MacDonald is always keen. Senator IAN MACDONALD: I have a couple of questions. I understand Senator Ludwig also raised some issues about the LHD, so please stop me if these have been asked. Admiral, you just mentioned the Adelaide is in the harbour in Melbourne? Vice Adm. Griggs : Both ships are in Melbourne. Senator IAN MACDONALD: But Adelaide has been steaming up for some months. Vice Adm. Griggs : That was the Canberra. Canberra is the first one. My case? too early? it's from 2014 and the discussion at the time with no one in the ADF saying they want it. . The matter has been since resolved to NO and excluded from the white paper. Last edited by optimist on 14 Feb 2019, 09:34, edited 1 time in total. The above nugget appears to suggest a 4th sqn replacement, if it happens, which is in the 2016 white paper. And as the 2016 white paper states is in the 2020s time-frame. Johnson said the f-35b was considered from day one. AKA ..we never wanted it. Of course the 4th or last 25 aircraft will be bought after the LHD. what is important is that there was nothing done to be able to put f-35b on them, in fact they even looked at removing the ski ramp during the build, but it would cost too much. There were concerns about swirling wind off of it and it would give another landing spot. Its not what Johnston says that needs to be considered. Its what Hurley, Griggs and Brown says. What is clear from the exchange is that there are many elements to a decision. Pre-2016, only some of these elements were addressed e.g. ship modifications which is what Griggs mentioned relating to 2009 white paper (which incidentally didn't say anything on the subject). The key elements especially force structure were clearly not reviewed before the 2016 white paper. I don't think that's indicative that a thorough consideration was already made pre-2016 in order to definitively state the ADF don't want it from day 1. Those details/requirements raised by Gen Hurley particular are not things that get debated and cleared in a short period of time. Rather, I think it could take many years of study and the RAAF/ADF are not known for hasty decisions. I think the decision of what would equip the 4th squadron would provide a clearer picture. P.s. not aussie but lived in Melbourne for a while (wife studied there). If they wanted it or even just the option for it, they would have had the LHD build compatible, as others of the class are. We didn't and could have easily made the wanted decision to remove the ski ramp. Something I now think would have been a good idea, if not for any other reason than threads like this. “Without revealing anything I should not, I was present in 2002 at Puckapunyal when the modelling was done to recommend either the Spanish or the French design. During the process, the question was asked if Treasury & Finance would provide additional funds to remove the fixed-wing capable light carrier elements of the Navantia design (ski jump, certain magazines and elevators, certain other systems, some weight and space). The answer was an emphatic no. All the systems were dual use. To my knowledge, none were removed or not installed. Therefore she is perfectly capable of operating something like SHAR or STOVL F-35, although undoubtedly additional kit would be needed (hence the weight and space mentioned above). Fire fighting for the extra spot was also going to cost a mint to redesign. but that is also another story. The bottom line was the cost to remove it was too great for any purpose it would serve. The ship would have to have too much redesign and testing for the removed weight. It came down to a cost benefit issue. No one is or was paying me to know this stuff, It's stuff I picked up. I don't know why I'm getting hooked into a retired RAN pilots wishful thinking, who's like a dog with a bone. everything has been argued to death there by people who know. There isn't anyone on this thread with even an unclass briefing on the subject, let alone a classified one and in the ADF/DMO with the decisions. There is enough in that link to the parliament to show that they thought abbot was on the wrong track, They are going to be polite and diplomatic, although this was felt to be needed to say, when it got too willing. Page 107 was the lead up to this. go and read what the said about the kopp and goon idiots. They kept it very professional. Nevertheless here is 'optimist' - the expert - qualifications unknown - telling us 'how it is' - with vague references. Cool. OMG! - an oldie but goldie from FARLEY from the not so distant past FEB 2017. Good grief: where will this debate END?! "Australia’s longstanding procurement plans may merit reconsideration. How deeply are Australia’s naval aviation acquisition plans set in stone? With the F-35A on the verge of appearing at the Avalon Air Show [Feb 2017 - this year also soon], debate over the appropriate version of the Joint Strike Fighter continues. Australia is purchasing the F-35, and Australia has already acquired two aircraft carriers [Wait WUT?! Nope LHDs] capable (with modifications) of operating the F-35B. Two years ago, the government conducted a study to examine the potential for purchasing the F-35B and modifying the two Canberra-class amphibs (built in Spain to the same design as the Juan Carlos I), but eventually rejected the proposal as too costly, and too detrimental to other naval objectives. But the debate continues, and as Australia’s strategic situation seems to be in flux... longstanding procurement plans may merit reconsideration. The pro-F-35B case rests on several prongs. First, the Canberra-class can, with the appropriate modifications, operate the F-35B. This would give the RAN some capabilities that it has not possessed since the 1980s. Moreover, the F-35B is, because of its sensor and communications capabilities, uniquely appropriate for operating off light carriers [LHDs boyo] such as the Canberra. Finally, with its ability to operate from small and unprepared airfields, the F-35B potentially offers more operational flexibility than its cousin (although this depends on the ability of the RAAF to manage the logistical difficulties of the complex, sophisticated aircraft). The case against the F-35B boils down to a few points; it is more technologically complex, has a shorter range, can carry less payload, and is more expensive than the F-35A. A corollary to this is that, if Australia purchases the F-35A, people will stop proposing converting the Canberra-class amphibs into light carriers, [hmmmm] which would substantially detract from their original purpose as amphibious warfare vessels...."
The case against the F-35B boils down to a few points; it is more technologically complex, has a shorter range, can carry less payload, and is more expensive than the F-35A. A corollary to this is that, [b]if Australia purchases the F-35A, people will stop proposing converting the Canberra-class amphibs into light carriers[/b], [hmmmm] which would substantially detract from their original purpose as amphibious warfare vessels...."
More technologically complex? I would agree the Killer Bee is more mechanically complex than the Model A, but not technologically. Ummm... if Australia purchaes the F-35A? I realize this was written in Feb 2017, but hadn't Australia already purchased its first Lightnings? If not, they were a partner nation, and were up to their neck in the program... that statement appears rather poorly written. Agree, however author have have been referring to the last tranche of some 24-26 or so F-35s - you may recall not known.